Standing three-quarter length in a brown lace-trimmed doublet. There is some doubt regarding the artist: Gibson (1983) attributes it to Paulus van Somer; in 1993 Ewan Mundy suggested the Circle of David Mytens instead. 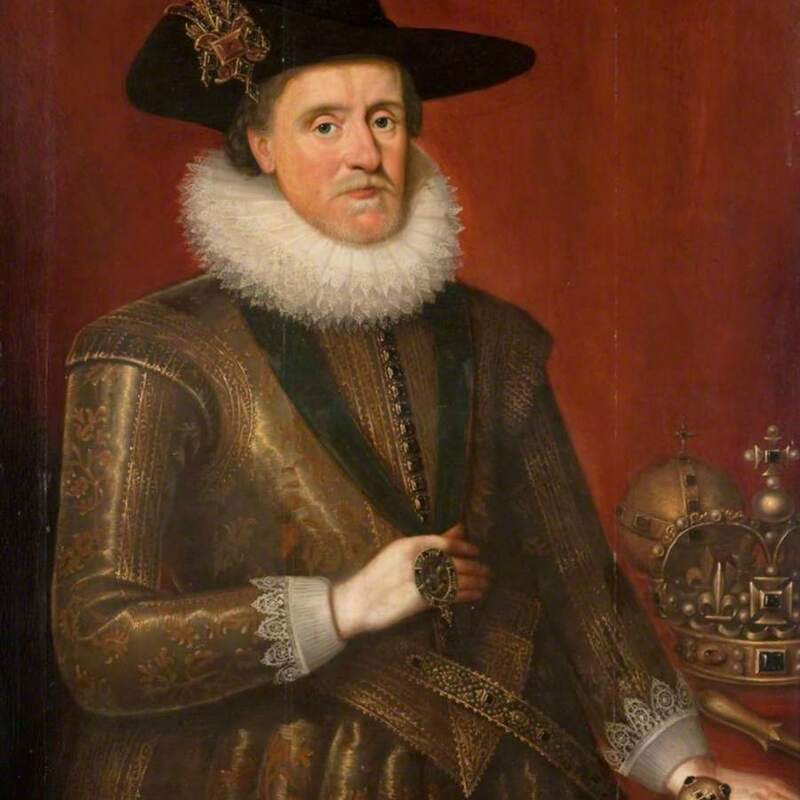 James was King of Scotland from 1567 and became King of England and Ireland following the death of Queen Elizabeth I in 1603. In 1599 he issued a Royal Charter, granting permission to Peter Lowe, Robert Hamilton, and William Spang (and their successors) to establish the body which is known today as the Royal College of Physicians and Surgeons of Glasgow. Lowe was also chief surgeon to the King’s son, Prince Henry. James was a prolific writer and tackled a diverse range of styles and subjects. Of particular note is his “Counterblaste to Tobacco”, an early anti-tobacco publication which appeared some 300 years before Richard Doll convinced the world of the dangers of smoking. There is a contemporary collected edition of his works in the College library. This portrait was obtained at auction around 1950 by Dr T. J. Honeyman and, after restoration, was presented to the College in 1952 by Professor G. B. Fleming. Although the exact date is unknown it was certainly painted after James acceded to the English throne, as he can be seen wearing the Lesser George of the Garter around his neck. 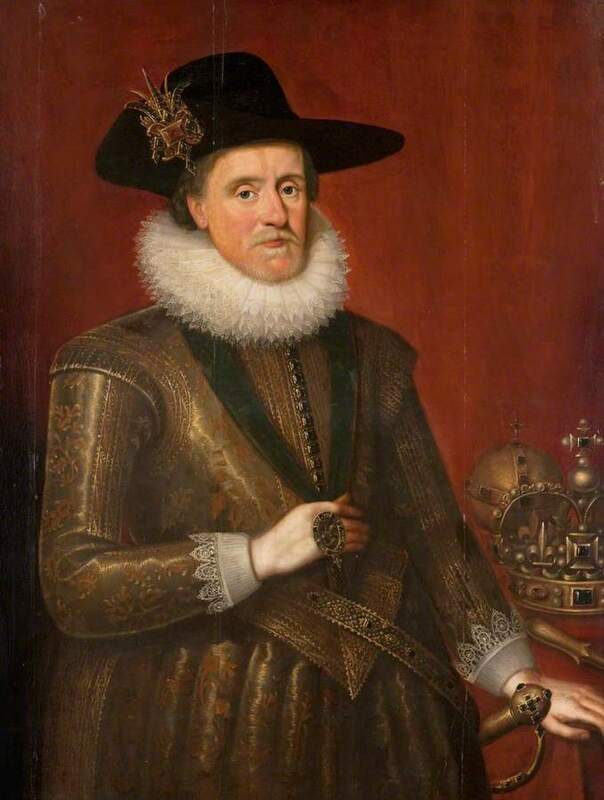 Paulus van Somer I (1576–1621) (circle of) and Circle of David Mytens, “Portrait of James VI and I (1566-1625),” Heritage, accessed April 22, 2019, https://heritage.rcpsg.ac.uk/items/show/386. Description: Standing three-quarter length in a brown lace-trimmed doublet. There is some doubt regarding the artist: Gibson (1983) attributes it to Paulus van Somer; in 1993 Ewan Mundy suggested the Circle of David Mytens instead.